Hello Orpheum fans! Your friendly neighbourhood goth singer here, so how are you ringing in the new year? Drinks and resolutions? I’m celebrating it with…knee surgery. A little over a year ago a tennis game gone wrong landed me with a messed up knee. A year and a very late MRI scan later revealed that I have no front ligament in my left knee. Basically you have two ligaments in each knee, front and back. I tore mine and over time it disintegrated so all that’s left is a little stump (ew!). Because of this, I can’t really jump, run, or do any crazy leg movements (no dancing the can-can for me!). I was told this is a very common injury, usually experienced by rugby or football players, and a routine surgery is all it’ll take. A few incisions here, a little bit taken from my hamstring and presto! A new knee ligament, ready for action! I was supposed to have the surgery in January but it got moved to the middle of February, right before we were supposed to gig at the Red Lion in support of Lightwish. Nuts! So how will I be celebrating Valentine’s Day? Either shooting sour grapes at the old people in my hospital room, or so doped up on meds I won’t care that I can’t walk. I’m supposed to be immobile for a while, not sure how long, maybe with some crutches, and then I get to experience the joys of physical therapy for a year. On the plus side, I’ll have some nifty scars! Whoo hoo! The lesson learned here is: don’t play tennis. Try fencing instead. I hope to only be immobile for a few weeks before I can walk again. The band is carrying on, we’re doing some recordings and will hopefully have some new tracks available soon! 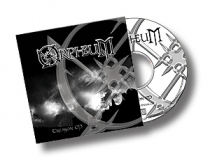 Tune in to Alive 107.3fm at 9pm this Friday (18th) for the Heavier Than Metal show hosted by Chris Walker for another blast of Orpheum on the Scottish airwaves! Many thanks again to Chris and for including us in his top 5 ones to watch in 2013! A nice review of our Treason EP has been posted by Ivan Tibos of Concrete Web in Belgium. Check it out in our press section or head over to concreteweb.be for a look! It was a great start for us in 2012, releasing our first EP; Treason, playing our first live shows, meeting and having the privilege of playing alongside some incredible bands and most importantly, meeting and receiving a great first reaction from you all! We want to thank you for making 2012 a great start for us and we shall make sure 2013 brings even more. Watch this space..